While the "gig economy" may be filled with promise for workers who want more flexibility, it's also legally and financially fraught for the employer and the employee. A growing number of lawsuits allege companies should not be classifying workers as free agents. For example, last month a California commission ruled that an Uber driver is really an employee. And on Tuesday, Hillary Clinton promised to "crack down on bosses who exploit employees by misclassifying them as contractors." The U.S. Department of Labor offered guidance this week on how it interprets the tests to determine whether a worker should be classified as an employee or independent contractor. The not-so-subtle message: The agency pretty much considers most workers to be employees under the Fair Labor Standards Act. And it is likely to apply a very broad definition when investigating a company's practices. "I think employers will be more cautious, because DOL has essentially declared war on the independent contractor relationship," said Tammy McCutchen, a compliance attorney at Littler Mendelson, a firm that represents employers. McCutchen also used to run the Labor Department's Wage and Hour Division. Put simply, independent contractors are cheaper for companies to hire. Employers don't have to offer them benefits like health insurance and 401(k)s, pay them overtime or give them paid days off. They don't have to pay into state unemployment insurance or worker's compensation funds on the contractors' behalf. And they don't have to cover the employer share of their payroll taxes or withhold income taxes. In return, contractors or freelancers should have autonomy deciding when, where and how to do the work assigned. They're free to take on projects with other companies. They essentially run their own business, and may even have their own employees, office space and equipment. That's how it's supposed to be. But the lines blur when a company hires someone to do work that might be considered "integral" to the core of the business - i.e., that a full-time employee normally does. Or when it dictates where, when or how the work should be done. Or when it restricts the worker's ability to work for other clients. If a company is found to have misclassified workers as independent contractors, it may have to pay legal fees, back wages, back taxes, penalties and damages. The Department of Labor together with the IRS and 22 states have cracked down on misclassification, resulting in employers having to pay $79 million in back wages for more than 100,000 workers in various industries last year alone. The Labor Department's mission is to be vigilant in protecting workers whose rights are being violated -- which it has done in industries as varied as construction, meat processing, landscaping and personnel services. But what if someone really wants to be classified as an independent contractor? In its guidance, the Labor Department explicitly said the "economic realities" of the working relationship determine whether a worker is an employee, and those would override any agreement that may have been made between the employer and the worker. That may pose a problem for some. 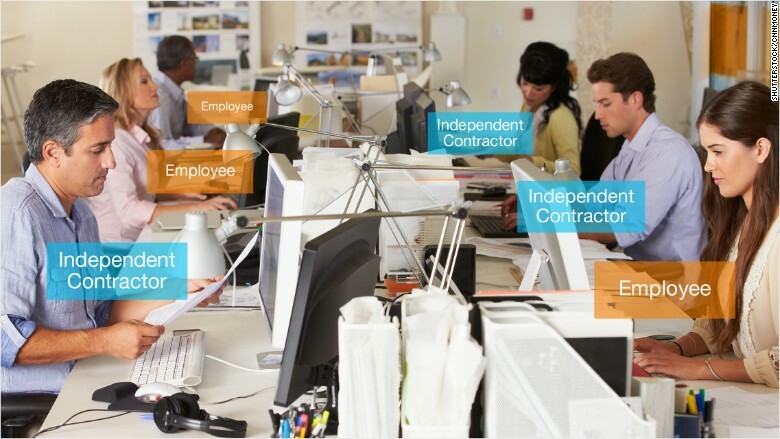 A survey by the Freelancers Union estimates that there are 21 million independent contractors in the United States. Another 2.8 million identify as freelance business owners. And a majority say they would "never" go back to a traditional 9-to-5 job, said Sara Horowitz, the union's executive director. Of course, the courts also have a big say in who's violating labor standards and who's really an independent worker. It's not clear whether they will view the definition of employee as broadly as the Labor Department in all cases.